I'm still hoping some people will be interested enough in the world of Almos to help me see the project through to completion. That being said, there's a lot of creative thinkers in this community and I'm hoping that, even if you're busy with your own projects, that some of you might be interested in helping the creation of the Almos set by participating in brief contests. This index thread will be where all of the contests are posted. It keeps things neat and clean as I'm hoping to have a fair number of contests to offer the community the very highest of ability to contribute to the set without actually creating the set itself. Each contest will last one week, similar to the CotW style. Depending on Mod cooperation, the polls may end up being posted in separate threads, but the contest and discussion about the contest should be kept here (if there are poll threads, getting feedback on specific entries there is fine.) I'll do my best to offer brief commentary on the entries if I can (depends on how many there are), but I would ask that, if the polling is kept to PMs, that you indicate at least one or two sentences about why you voted for who you did. In the event that poll threads are created, you can always make a reply there to explain your vote, or, if you wish to remain anonymous, you may PM me. Most prizes for most contests will be intangible rewards from within the set. Winners will have the opportunities to develop epic mythics and powerful rares. They'll have chances to get their own name (or a name of their choosing) dropped in to the setting's story / background. However, no matter what one might win intangibly, there will also be a running points total. These points will determine grand prize winners, who will receive some sort of tangible gift. Be it something physical, or merely a gift card. That much has yet to be decided. The contests will go on until the Almos project is completed. 1: Putting in an acceptable entry for the contest. As of right now, I've not determined how the points will be constructed in the final prize. But there are a few options: Random drawing, this would be a compelling method as it would encourage newer or more novice posters (such as myself) to keep up with the contests as participation will still give you a decent chance of winning something; Rank drawing, the easiest system, the people with the most points get the rewards; Multiple prizes with mixed entry methods, this could include both Rank drawing and random drawing, there would be a lot more prizes than a simple "top 3" or what-have-you, but the prizes would also be cheaper in nature. The kingdom of Woufalem is primarily agricultural, but they have a strong military structure supported by mandatory service for at least a few years before being able to settle down and find a trade or some other form of employment. 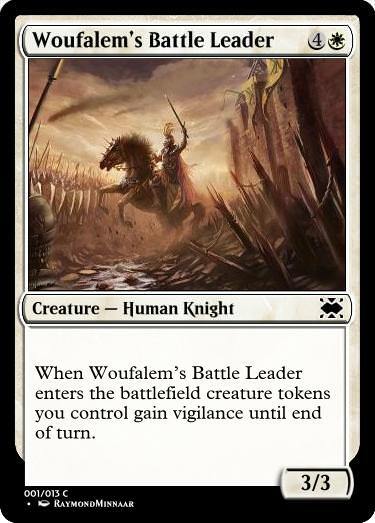 Token interaction and creation: Woufalem has one of the largest armies in Almos with Defensive playstyle, holding out against opponents until they're able to turn the tide with a sweeping victory. Warriors, soldiers, knights, paladins, and clerics are common class types. The academy of New Eteras is full of scholars. Though their floating city is big enough to house greenhouses capable of producing for the students there, New Eteras, being a more neutral party, does plenty of trade with other kingdoms for its needs. 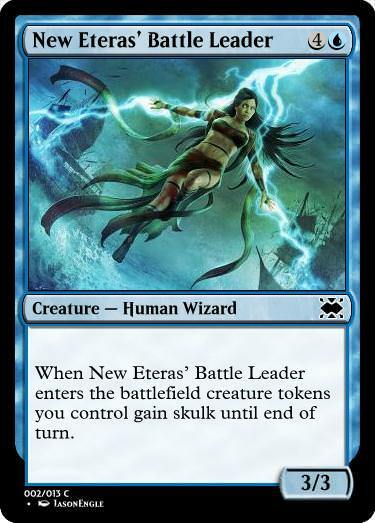 Offensive, New Eteras mages find balance between offense and defense, being able to quickly strike out in decisive fashion to take control of a game (similar to White) while also slowing down opponents and controlling the game's pace. The kingdom of Frenhelm are made up primarily of hunters and gatherers. They do some agriculture, primarily that which can thrive in swamps. Military service is not only mandatory, each citizen must maintain fighting readiness as they are still considered a part of the military even after completing a service rotation. Military service in Frenhelm is for life. Offensive, with slippery, evasive aggression. 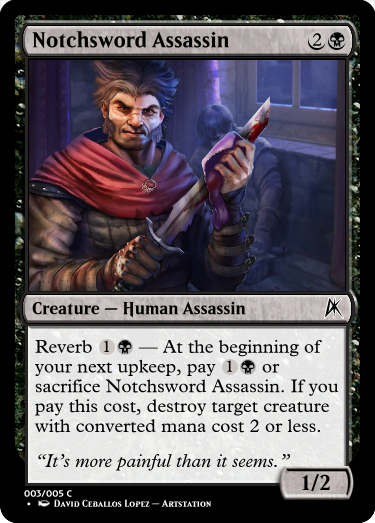 Assassins and more powerful undead are able to take advantage of the shadows, and/or fear, in order to deal devastating damage directly to their enemies, keeping control of the board by removing threats and punishing opponents. The Nomads known as the Rajihim are wanderers and provide for themselves through hunting, gathering, and by trade, being trade partners with all kingdoms, even though they still hold in anger and malice toward Woufalem. 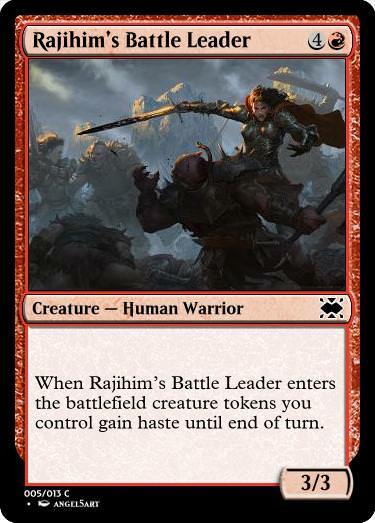 Red is its usual aggressive self, hitting opponents hard and often, utilizing spells of immense strength and ensuring a steady army of creatures that can get out and attack. 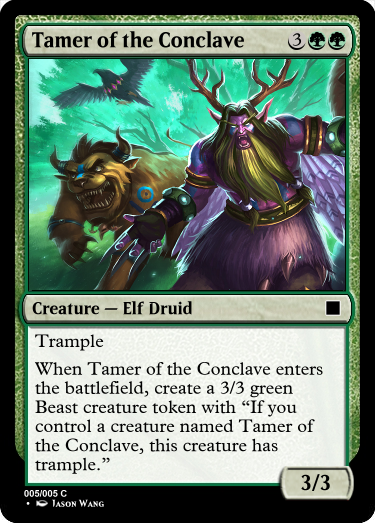 The Conclave of Druids are protectors of the balance of Almos. As such, they have spies everywhere, and attempt to use political connections to keep the two strongest kingdoms away from outright war. With war erupting nevertheless, they play both sides, ensuring that whoever wins, balance is maintained by protecting the losing side from outright annihilation. 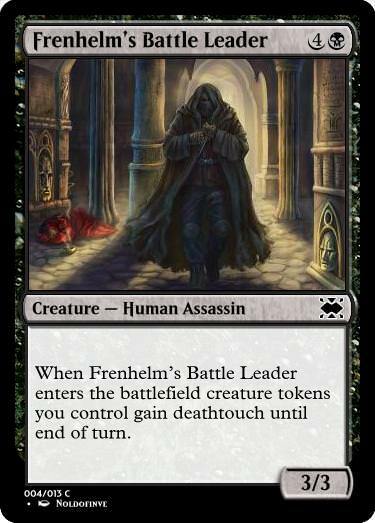 Trample, hexproof, creature fetch; Token interactions and creation. Green creates big tokens that can quickly dish out the pain, while also creating smaller tokens that can act as support. They have ways of evening out the numbers on a battlefield, and can support token-oriented decks by providing stronger token creation; Green is slow and steady. Per usual, they ramp up quickly, and then use that power to methodically plow through the field, delivering one powerful blow at the very end. prize: Design your own legendary creature (rare rarity) with the only condition that it interact with tokens in one form or another. 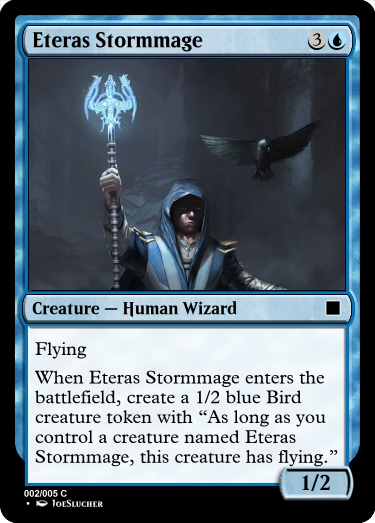 This time, entrants will be asked to produce an uncommon instant or sorcery spell that directly deals with creature tokens in some inhibiting way. 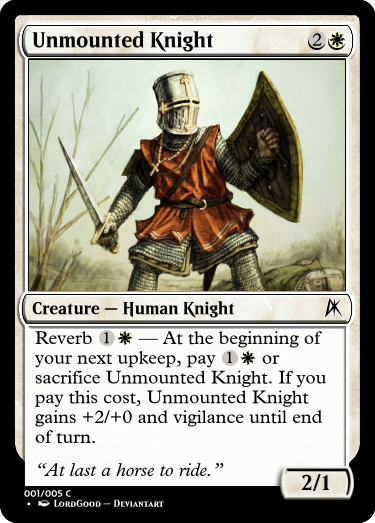 If the set is driven around large token armies, it would only make sense that it would also produce more cards that specifically deal with those problems. I was tempted to ask for another cycle, but, in the end, I figured that the challenges could get tedious if each of them were cycles. However, you CAN submit more than one card to this specific contest and each card will be judged on its own, rather than as a collection of cards. Limit of 5 entries. Card must be uncommon and should reflect its rarity in its effect. Card should be usable in limited and constructed. 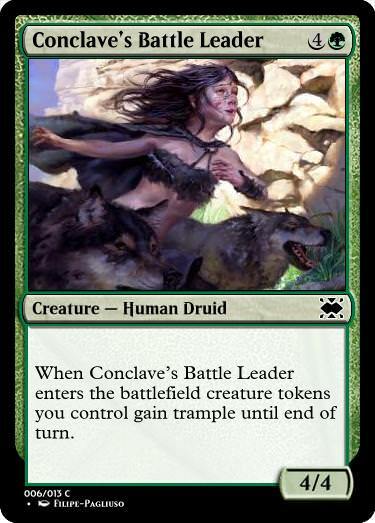 Card MUST deal with tokens in some way. Specifically, in a manner that controls the number of tokens on the board. You can also use any set mechanics that you would like. However, given the reqs for this challenge, Replay, Ritual, or Foretell are the two mechanics that seem most likely to show up on an instant or sorcery. Open to feedback. Not sure if captured the right race/class mixture for the world. Edit: Updated faction races/classes to better fit based on source material. Ah, I didn't specify the races, which is my own issue. I'll accept these and fix them as needed to fit the setting. Updating the contest thing now though. Interesting - I'll definitely ponder about an entry. Do we have mechanics to work with yet, or do we just make some ourselves if we feel like it? Forgot to post those as well. Herp derp. I'm going to link in the project thread, but I'll also put the mechanics in the main post. Updated main thread with current set mechanics. 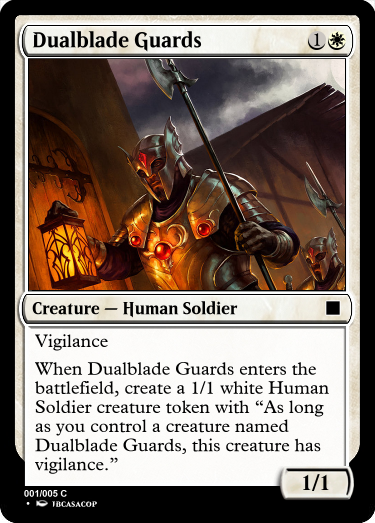 - Create a 1/1 white Soldier creature token. - You gain 3 life. - Create a 1/1 blue Wizard creature token. 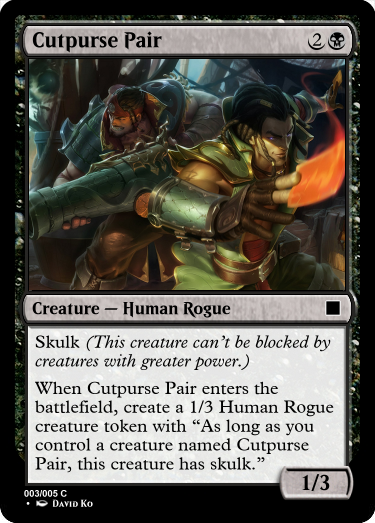 - Create a 1/1 black Skeleton creature token. - Target opponent loses 2 life. 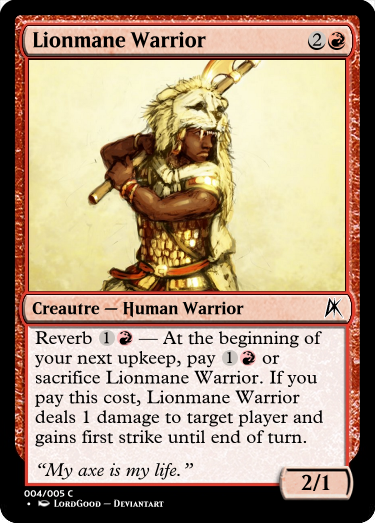 - Create a 1/1 red Nomad creature token. 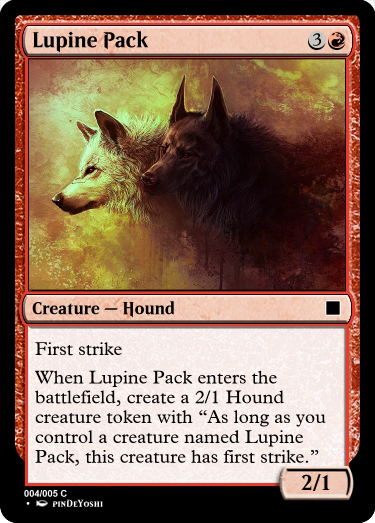 - Creatures you control get +1/+0 until end of turn. - Create a 1/1 green Plant creature token. 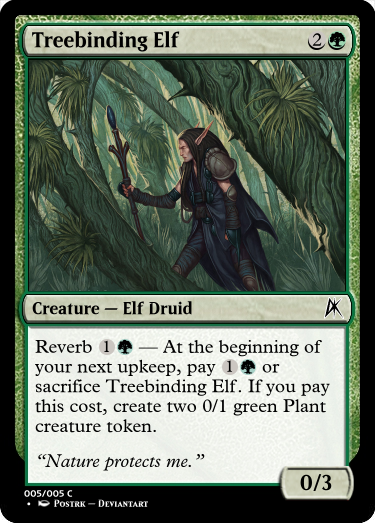 notes: green sort of breaks this cycle, but I figured green would lack a keyword so it could get the most efficient body, as is fitting of green. Art to be linked soon(TM). Entries through Yoshi have been added to the contest post. Edit: fixed some typo and errors. Added Akai Ryu. 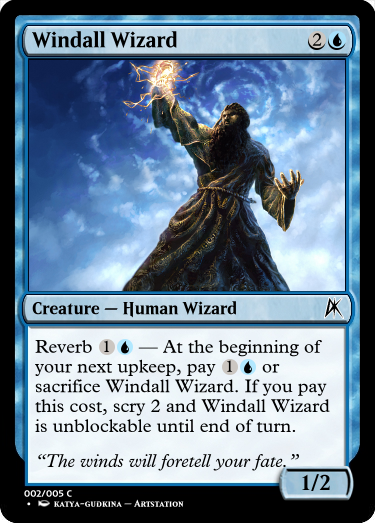 I love the take on Reverb, as I'd designed it primarily for enchantments and the like, but you made a fun little cycle with it. Also, as a note, some of you had less information to go on. If you want to redo any of your entries, feel free. Just let me know so I can update them. My fault for being late on this one. Voting is open until Friday, 8/24/2018. ANYONE can vote, even if you didn't give an entry, just send me a PM with your vote. Obviously, you can't vote for yourself. Last day to vote. You do not have to have an entry to vote. Oh, I'll still be picking as well. I think he is hoping for feedback from the community. But yeah, I see your point. Also, I love your sig. I didn't get enough votes. I do think a poll would work better, but, for now, I'm going to rate them and announce the winner tomorrow. Found some time right now. First contest winner is Akai Ryu. viriss was the runner-up. However, all of the entries were awesome enough that I'm giving an additional bonus point to everyone for participating in the very first contest. How does Reverb work? It's confusing like it will trigger every upkeep. Seems like Echo might do what you're looking for. Card must be an instant or sorcery. I gave them all "Draw a card" to help prevent having it be a dead card.